This is a simple Vanilla Cup Cakes recipe where you need minimum ingredients and they really taste good. 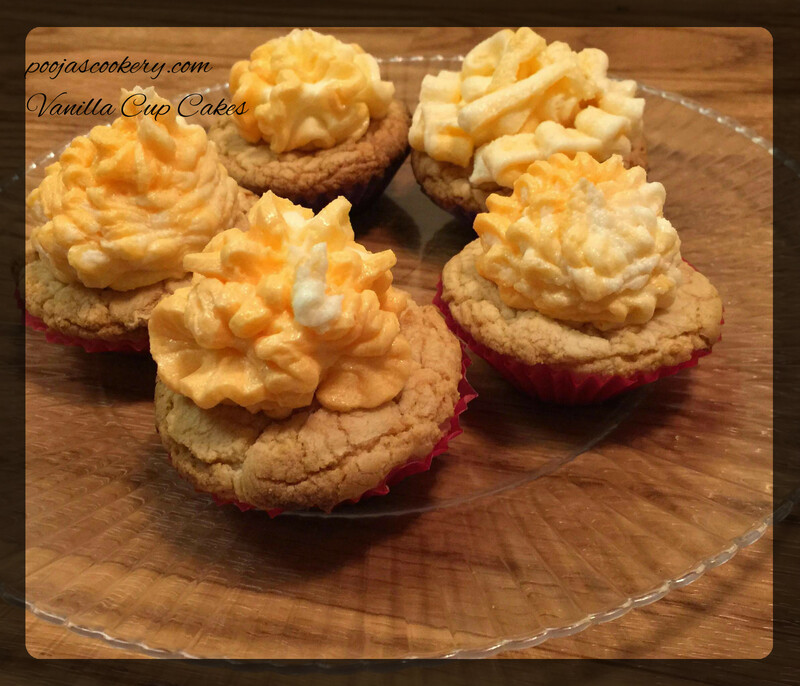 So here is the step by step vanilla cup cakes recipe for you. Beat the egg along with oil and essence for about a minute. Sift All Purpose flour and baking powder in a mixing bowl and add this egg mixture into it. Add Sugar and beat until it gets nicely mixed. Pour this into the Cup liners placed in the cup cake trays and bake at 350 degree Fahrenheit preheated oven for around 30 minutes. Check in between with a tooth pick . Remove and keep for cooling on the cooling rack. Beat the butter kept at room temperature along with sugar on low speed. Once the sugar is mixed, increase the speed and beat for about 5 minutes. Add vanilla essence and beat for few more seconds. If you feel the mixture is too thick for spreading, add little milk and beat. Keep beating until you get nice smooth texture of butter cream. According to your ideas, you can add food color in this cream to give it more exciting look. Now with the cake decorating injector, decorate your cup cakes.